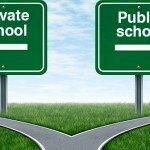 Some differences between public and private schools are obvious. But deciding what's right for your child entails shedding light on the subtle distinctions many parents ignore. But as a dissenting view from the Thomas B. Fordham Foundation’s Education Gadfly newsletter showed, the debate over which kind of school does a better job is far from settled.